Safe Electricity provides tips to help people stay safe, stay cool, and save money on their energy bills when the temperatures get hot in the summer. 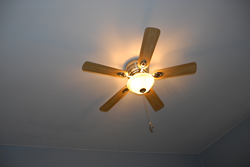 Make sure ceiling fans are moving in a counter-clockwise direction, which forces air down and creates a cooling effect. There are many easy steps you can take to lower your electrical demand in the summer, which also saves you money on your energy bill. Because temperatures rise in the summer, so can electricity use, and that can put a strain on electrical systems and home energy budgets. Air conditioners are consuming more energy in summer months than at other times of the year, and electrical systems must work hard to power the increased demand. Safe Electricity shares tips to help people stay safe, stay cool, and save money during peak times of summer heat. The increased demand for electricity can strain a home’s electrical system, increasing the likelihood of an electric shock or fire. During times of excessive heat, the high demand is coming from many homes and many businesses, which can add to possibilities of electrical grid overloads and failures. “Cooling your home efficiently this summer does not have to be difficult. There are many easy steps you can take to lower your electrical demand in the summer, which also saves you money on your energy bill,” says Molly Hall, executive director of the Energy Education Council and its Safe Electricity program. Use curtains and blinds to keep the sun out on hot days. Operate the thermostat as efficiently as possible. The smaller the difference between your thermostat and the outdoor air temperature, the greater the energy and utility bill savings. Just a few degrees can make a big difference, so set the thermostat as high as comfortable. Make sure that vents are not blocked. It is also a good idea to vacuum air registers to remove the buildup of dust and debris that could block cold air from circulating throughout the house. A routine annual inspection and regular maintenance of the current unit can help it to run more efficiently. Turn off power to the air conditioner before any work is done on it. Clean or replace filters. Outside, clear leaves and other debris away from the condensing unit. Hose off any accumulated dirt. Avoid unnecessary trips out the door in the heat of the day. If it gets cool enough at night, windows can be opened to let cooler air in. Then close them in the morning to trap it. Seal cracks around the house with weather stripping and caulk to keep cold air in and hot air out. Ventilation is one of the most efficient ways to keep a building cool. Attic vents and fans can help reduce energy costs. Consider shading a home by installing awnings over windows in direct sunlight. If looking for a new air conditioning unit, be sure to check out an Energy Star rated model. Appliances with an Energy Star rating meet and often exceed energy efficiency standards and can end up saving you money over the lifetime of the appliance. Make sure a home has the insulation it needs. EnergySavers.gov has information about the best insulation to use in different geographic areas. Safety is important, so do not simply ignore rising temperatures. According to the Centers for Disease Control and Prevention, approximately 675 Americans die every year from heat-related causes. Prevent heat-related illnesses by seeking out cool environments, drinking lots of water, and wearing light clothes. Know the signs of heat exhaustion and heat stroke. A person who is experiencing heavy sweating and weakness should immediately seek a cool environment, drink water, and apply a cold compress. If these symptoms progress to high temperature, vomiting, and unconsciousness, seek emergency medical attention. For more information on energy safety and efficiency, visit SafeElectricity.org.